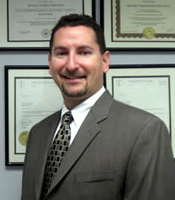 Dr. Michael C. Edelstein is Board Certified by The American Board of Podiatric Orthopedics and Primary Podiatric Medicine, as well as a Fellow of The American College of Foot and Ankle Orthopedics and Medicine. Dr. Edelstein graduated from The State University College of New York at Oneonta in 1990 and The New York College of Podiatric Medicine in 1995. He then completed residency programs at St. Clare's Hospital and Health Center and The New York College of Podiatric Medicine and Affiliated Hospitals and Institutions. Dr. Edelstein has been in private practice since 1997 treating pediatrics, adults, geriatrics and the developmentally disabled population. Dr. Edelstein is a skilled, experienced, compassionate physician who puts the needs of his patients first. He is dedicated to providing only the best patient care. Dr. Edelstein is married and the proud father of a son and daughter. He enjoys spending time with family and playing competitive USTA team tennis.